Do you have a little one who needs to bring Halloween treats to friends/schoolmates? 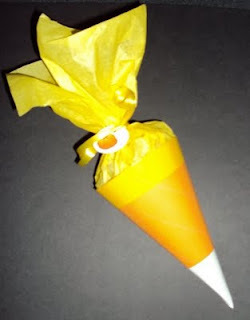 I found this template for candy corn cones on a blog I follow. Just print the template on card stock, cut them out, double side tape them into a cone shape, double side tape a strip of tissue paper to the inside of the cone, fill, add a little tag & tie. I found the coolest treat to fill them with in the cracker aisle… Kraft Jet-Puffed marshmallows! They come in individual packets, in chocolate, strawberry, or regular marshmallows. YUMMY! Okay so everyone has seen these tissue pom-poms… right?? They’re everywhere these days, and for good reason. Not only are they a super cute decoration, but they’re cheap and easy to make too! They would be adorable in a nursery, but since I already have a mobile hanging from the ceiling in Liv’s room and a pink polka dotted flying cow from FlyingZoo hanging in Elle’s room, the ceilings are at their max. 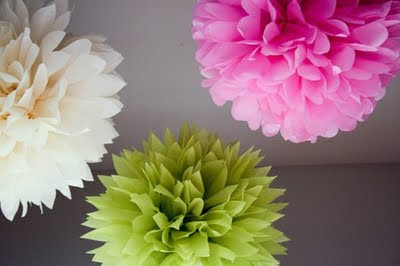 Soooo, I was excited to incorporate the pom-poms into a party I planned. Here’s the link to the instructions on how to make these yourself. You can pick up tissue and wire for pretty cheap, but Martha Stewart has a kit for these at Michaels, and I think it’s worth the extra money. The tissue in the kit is heavier weight than you typically find at a party store, which makes for a fuller, sturdier pom-pom. We hung these with 3M hooks (gotta love those things!!) & invisible thread over the food spread and outside the front door. 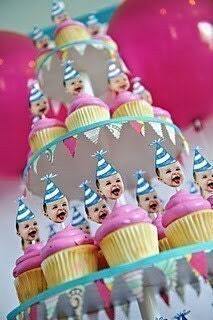 They were a big hit at Liv’s party and one of the easiest party decorations ever! Time to draw names if you’re doing a Christmas Gift Exchange! My parents, my siblings, and our spouses always exchange names for Christmas. My Doug and I… and now one of my brothers is in school here too… are in Fl and the rest of my family is in IL, so it’s not easy to draw names long distance. This year I found an awesome site that is going to make it easy for us, but has some really cool features that will make you want to use even if all your gifters/giftees are in one spot. It’s DrawNames.com and it’s FREE! What would we do without the internet?! The winner by random draw is AStarrA! Thank you to everyone who left a comment to win! Tiny toes, pudgy cheeks, sweet cries, wrist rolls, and finger squeezes have filled my days of late and been a distraction (although a pleasant one) from sewing/crafting/Elle Belle and pretty much everything else. But some semblance of a routine is emerging and I’ve eagerly returned to my sewing machine and blog. I’m happy to be back and have lots of fun stuff to post about but first, a celebration is in order. Let’s celebrating the return of my creative outlet, my guilty pleasure, and all Mommies who have something they’re passionate about in addition to their families! What better way to celebrate blog style than with a giveaway?! Just in time for Halloween, I’m giving away a trick-or-treat tote bag! 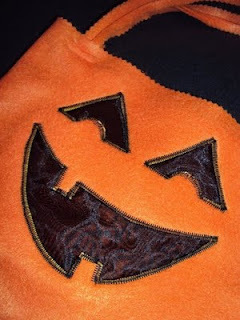 This isn’t just any trick-or-treat bag; it’s constructed with felt and has sturdy felt handles. A cutesy punkin face is appliquéd on the front with sheer black fabric … “why sheer?” you ask… because it GLOWS! 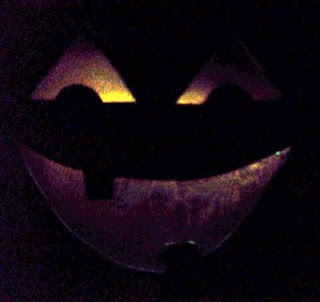 There’s a pocket behind the pumpkin face for a glow stick. Required entry: Check out my Etsy shop (it’s sort of slim pickin’ right now, due to that little distraction I mentioned) and leave a comment about your favorite item. Give me a suggestion for Halloween costumes I could dress my girls in this year… I’m thinking they should go together in some way like Bo Peep and a sheep… they’re 4yrs and 8weeks old. Leave your comment(s) by midnight EST Oct. 15th, the winner will be contacted and announced on the 16th.